It was my dear, dear friend's birthday last week, and although it comes a little late, we were finally able to get together and celebrate. I've known her for the majority of my life (since junior kindergarten), and we've shared so many fun and crazy memories over the years. While I've met and been acquainted with many other people over the years, she still remains my oldest and dearest friend, so I naturally had to bake her a little birthday treat. I made a simple but classic Chocolate Layer Cake with Chocolate Buttercream. The cake recipe comes from Kate Zuckerman's The Sweet Life, a dessert cookbook that I'm in love with. The cake was easy to put together and baked beautifully. It's a nice dense cake that will hold well when you're making a multiple-layer cake, and it also retains its moisture really well. It's a fabulous base for any chocolate cake you might be making. 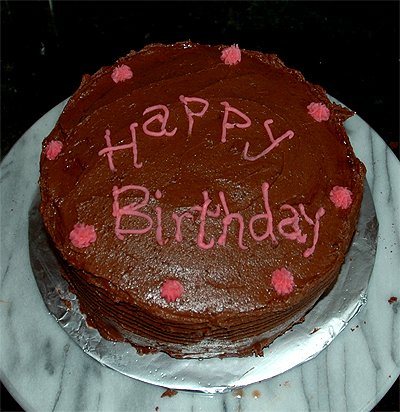 The chocolate buttercream recipe I used comes from Williams-Sonoma. I was originally going to make the Milk Chocolate Ganache frosting that Zuckerman recommended with the cake, but I didn't have enough milk chocolate lying around the house. 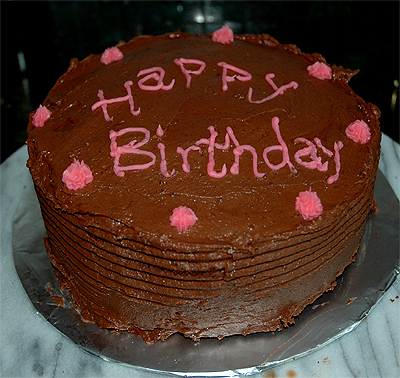 The chocolate buttercream is a nice alternative, giving the cake a richer chocolate taste due to the use of bittersweet chocolate. I'll admit, the cake doesn't look pretty or anything. I've never been great with cake decorating, and I would love to take a course on cake decorating some day in the future. But it does give it that homey, quirky look, which reflects both my personality and the relationship between my friend and I. Happy Birthday Kaela! To many more ugly but (hopefully) delicious cakes and memories!!! Posted by Bonita at 6:14 p.m.